• Height of more than 15 inches at the highest point of the shoulder blades. A wicket like the one below is used by AKC judges to measure the height of basset hounds if they suspect that they may be too tall. AKC judges use a tape measure to set the wicket at 15”. The handler of a dog to be measured is asked by the judge to stack the dog. When the judge and handler are satisfied that the dog is set correctly the judge places the wicket over the highest point of shoulders. 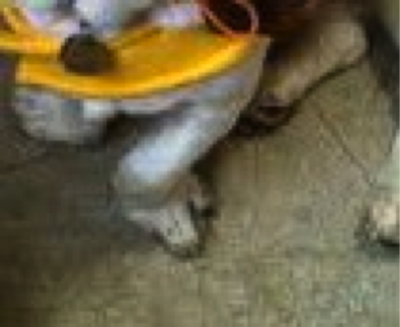 If both feet of the wicket do not reach the ground, floor or ramp the dog is considered to be over the correct height and is disqualified by the judge. This is the approximate position of where the wicket is placed by the judge. • Knuckled over front legs. 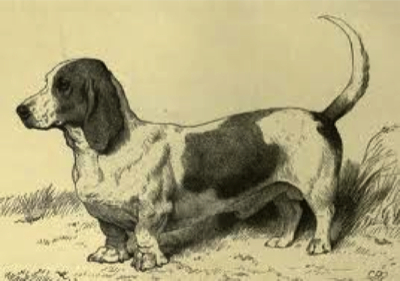 One only has to look at many of the drawings and even some early photos of basset hounds to understand the reason behind this disqualification. 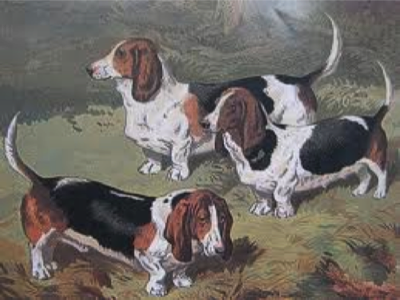 In the drawings above the front legs of some of the bassets seem to be deformed at the knee. Basset hound historians from the time mentioned this issue and tried to breed away from it. They felt it was caused by dwarfism or possibly by a poor diet. 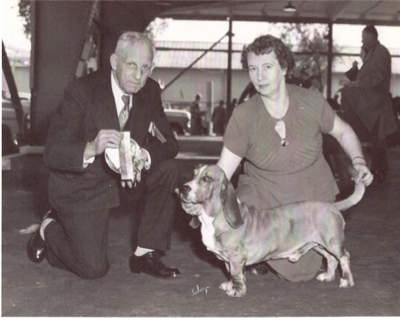 The example on the right is an actual show dog that earned an AKC Championship in the 1950s. In the show ring today this would be very rare. 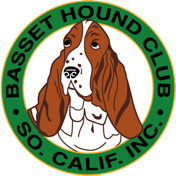 Because this condition can cripple bassets the AKC Standard for Basset Hounds lists “knuckled over” as a disqualification after it’s revision in 1964. If judges see a knuckled over front leg they are supposed to disqualify the dog from competition. While knuckled over fronts are very rare in bassets bred for showing they are still far too common in the ones bred as pets. The examples below show what to look for, but unfortunately this problem rarely shows up before a dog is a year old. 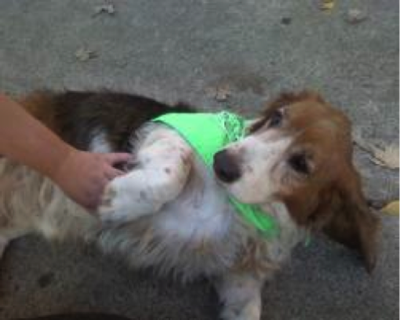 This was a pet store basset that was badly knuckled over on both front legs. 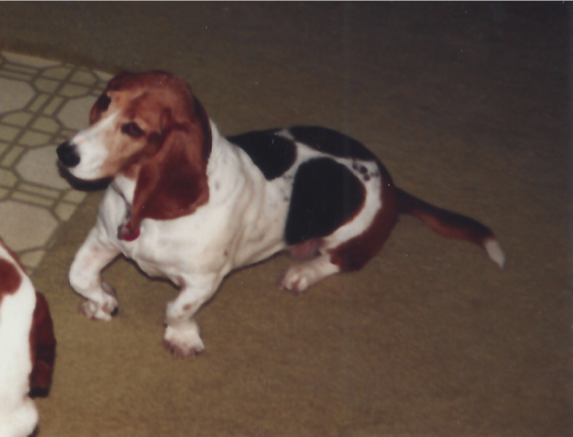 Examples of badly knuckled over bassets. Today there is still a controversy on where knuckling over comes from. While it is something that can be hereditary there are some who still believe it can be caused by diet. Whatever its cause it is a condition still far too common in the breed. 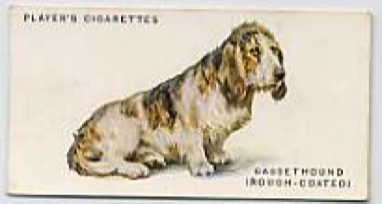 The issue of basset hounds with long coats or rough coats goes back a long way, perhaps even before the breed was established. 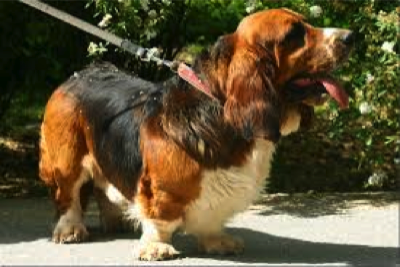 In the beginning long coat basset hounds were considered to be no different than the short coat bassets and they were shown together at dog shows. 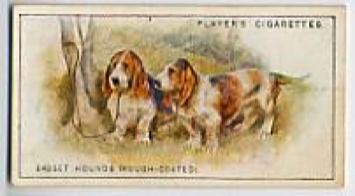 The cigarette cards above from the 1800s show examples of long or rough coated basset hounds. This is a copy of a painting from the same time period. Today basset hounds with long hair still exist. The genes that cause the condition are highly recessive but are still there. 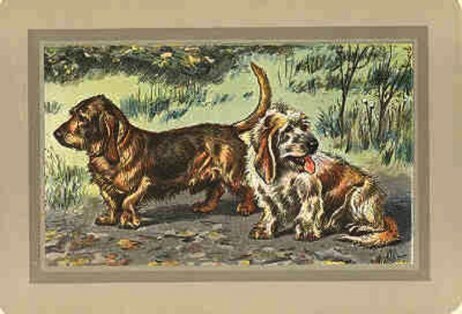 A long hair basset is possible in any litter, but breeding two long coated basset hounds does not produce long coated puppies. 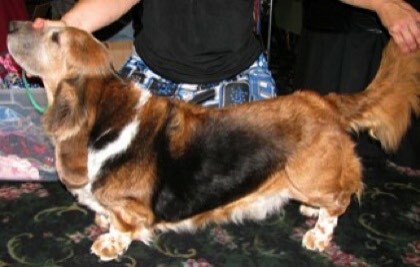 Below are some modern examples of long coated bassets. 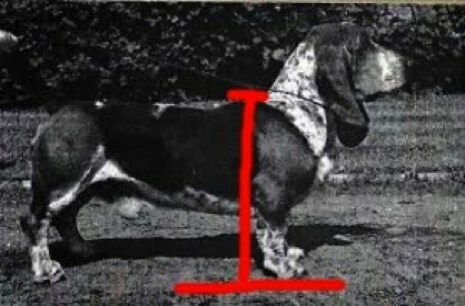 In the picture below the basset hounds show the difference between long and short coat. 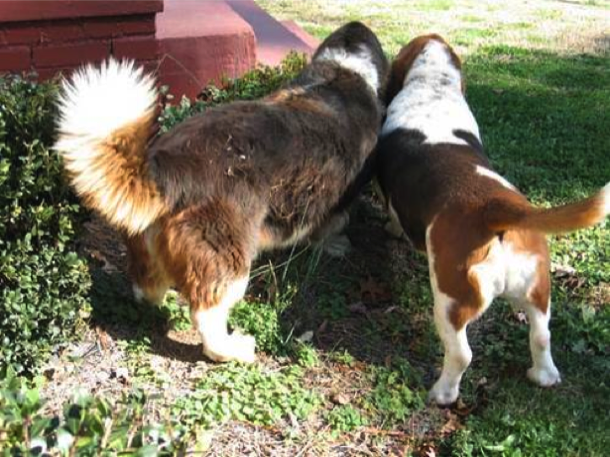 It is possible that these two bassets are litter mates. 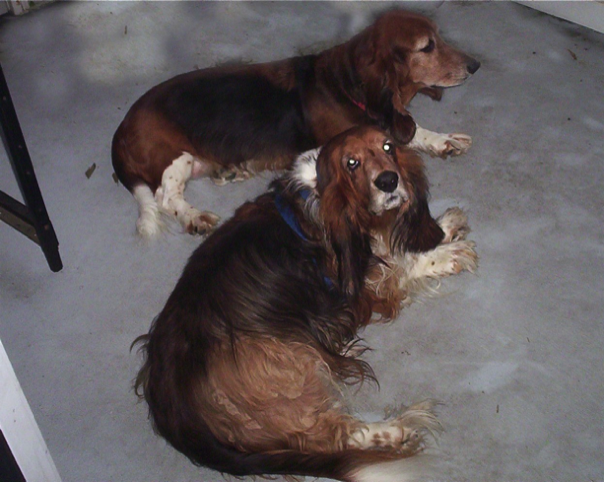 The two basset hounds below are litter mates. All pictures on this page are here for educational purposes only. 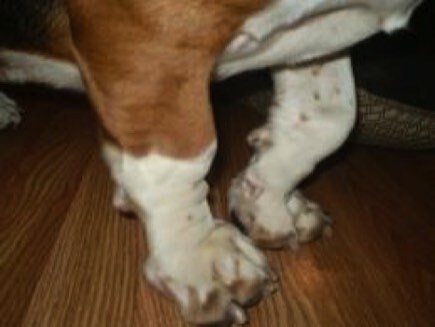 We feel it is important for people to see examples of basset hounds with these disqualifications. Note: To our knowledge this dog was not too tall. 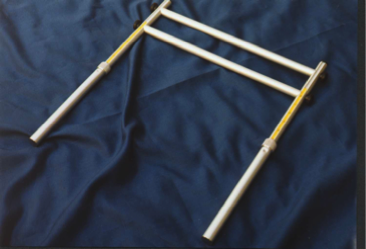 The picture is used here solely for educational purposes in showing the placement of the wicket.